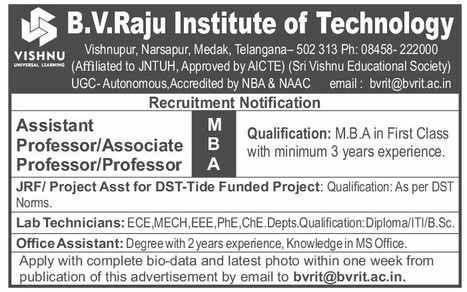 B.V.Raju Institute of Technology, Medak has advertised in the EENADU newspaper for recruitment of Professor / Associate Professor / Assistant Professor Plus Non-Faculty jobs vacancies. Interested and eligible job aspirants are requested to apply within 07 days from 01st Feb 2019. Check out further more details below. About College : Padmasri Dr. B.V.Raju Institute of Technology (BVRIT) was established by the eminent philanthropist (Late) Padmabhushan Dr. B.V. Raju under the aegis of Sri Vishnu Educational Society (SVES) in the year 1997. The Institute is duly approved by the AICTE and the Government of Andhra Pradesh and is affiliated to JNTU, HYDERABAD. BVRIT is accredited by both NBA and NAAC, New Delhi.